The NCCAH has released two new fact sheets! 1. Indigenous Children and the Child Welfare System in Canada provides the historical context of child protection and removal; the current Indigenous child welfare framework including funding and legislation arrangements, child welfare models, and types of agencies; and the movement towards reconciliation in child welfare in Canada. 2. 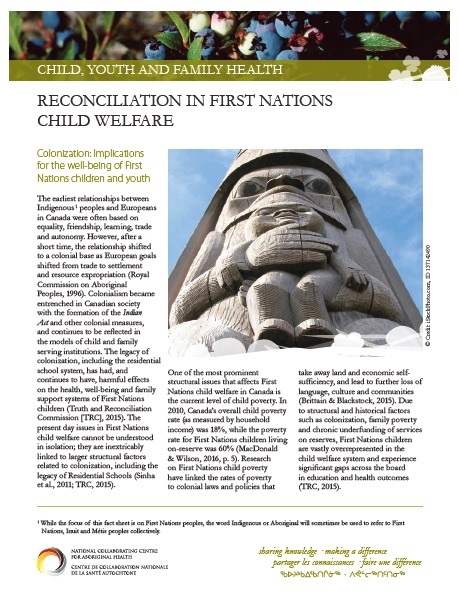 Reconciliation in First Nations child welfare looks at the structural factors leading to inequities in First Nations child welfare, rooted in colonization, which result in the overrepresentation of First Nations children in out-of-home care. Reconciliation requires public awareness of and action to address these issues. To download these and other NCCAH fact sheets, click here.